Beautiful independent house directly on the sea in Pomonte, small village on the western coast "Costa del Sole" of Elba Island, Italy. 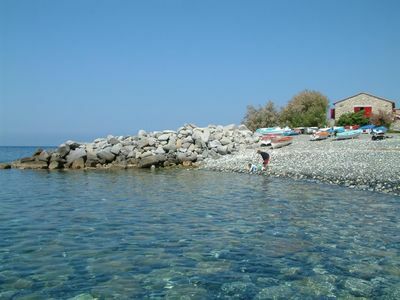 Pomonte is between impressive sea cliffs and cute little inlets, surrounded by luxuriant Mediterranean scrub, on the slopes of the highest mountain of the island, Mount Capanne. Either for expert trekkers or for nature lovers, it's possible to have great long walks, either on cliff paths along the cost or going to the inland, towards the mountains. From Pomonte start a lot of different paths, perfectly signposted, leading to the top of the mountains.